Senator Elizabeth Warren’s Regional Director for Sudbury, Nairoby Gabriel, and Staff Assistant, Farrah Ridore, visited B’nai B’rith Housing’s development, The Coolidge at Sudbury, today, May 8, 2018. 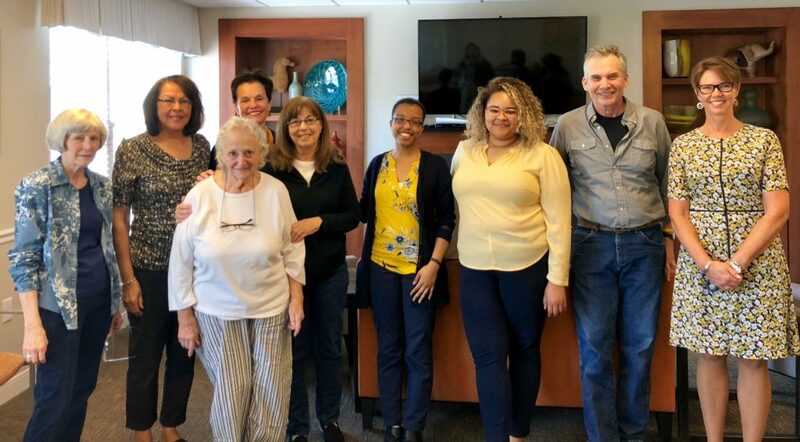 Gabriel and Ridore toured the building and met with residents and staff to talk about affordable housing as part of the second annual Our Homes, Our Voices National Housing Week of Action. During the week of May 1-8, advocates from across the country organized activities to raise awareness around the need for greater federal investments in affordable homes and community development. This visit with Senator Warren’s staff was coordinated by B’nai B’rith International, an international human rights advocacy group, and B’nai B’rith Housing (BBH), a regional nonprofit housing developer whose mission is to ease the housing crisis in the Greater Boston area by working with cities and towns to create economically viable, affordable housing options. In the Greater Boston area and across the nation, far too many low-income seniors, hard-working individuals, and families struggle to keep a roof over their heads, and our nation’s investments in affordable housing have been unable to keep pace with rising rents. The Coolidge at Sudbury is a shining example of B’nai B’rith Housing’s innovative and award-winning, service-enriched affordable housing model. The 64-unit rental community for adults ages 55+, was completed in 2014 with the support of the Low Income Housing Tax Credit. The development is fully leased with a growing wait list of interested tenants. Current residents at The Coolidge include employees of local businesses, retired Sudbury town workers, and many seniors who might otherwise not have been able to remain in Sudbury near their family and friends. The Coolidge features include an on-site resident services coordinator, partnerships with service providers, and a multitude of building amenities (outside common spaces, a library, and a fitness center) that allow residents to thrive in the community they call home. Phase 2 of The Coolidge at Sudbury is now in development. Prior to the opening of The Coolidge at Sudbury, senior housing, particularly affordable senior housing, did not exist in or around Sudbury, despite the obvious need. Over 25% of Sudbury households have at least one member who is over 60 years old, and more than one quarter consist of individuals living alone, many of whom earn less than $50,000 per year. Despite the growing need nationally, three out of every four U.S. families in need of housing assistance are turned away due to a lack of funding, forcing them to make harmful tradeoffs and skimp on groceries, medical care, and other basic needs. Every state and congressional district is directly impacted. Last year, advocates and Congressional champions secured a 10% increase to federal investments in affordable housing. But threats remain. The current federal budget proposes to slash affordable housing by $11 billion – a move that could increase homelessness and housing poverty. Instead of reducing our nation’s investments in affordable housing, the Our Homes, Our Voices initiative encourages individuals and organizations to make bold and sustained commitments to ensure that everyone has a safe, accessible and affordable home.